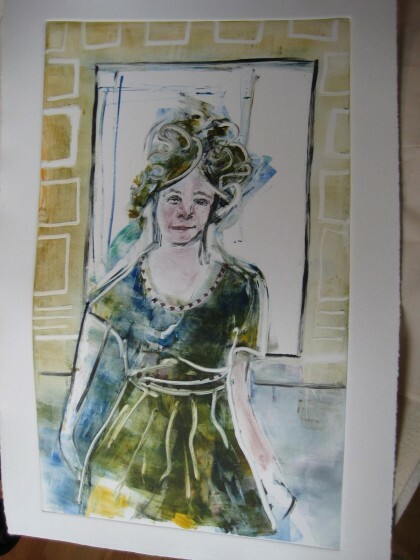 I was thrilled to receive an email late yesterday afternoon confirming my monotype Deja Vu (Jane Austen’s Universe) has been juried into the 2013 Prescott Park Arts Festival here in Portsmouth. I’m sure Deja Vu (Jane Austen’s University) will feel very much at home in her summertime exhibition space which is the circa 1740 timber frame Sheafe Warehouse located in Prescott Park. The 2013 Prescott Park Arts Festival art exhibit opens with a reception from 5 p.m. until 7 p.m. this Friday, June 28, and is on view daily beginning at 12 Noon through August 25. Here’s a sneak preview of Deja Vu (Jane Austen’s Universe). The photo below shows this new monotype seconds after I lifted it off the press in March.